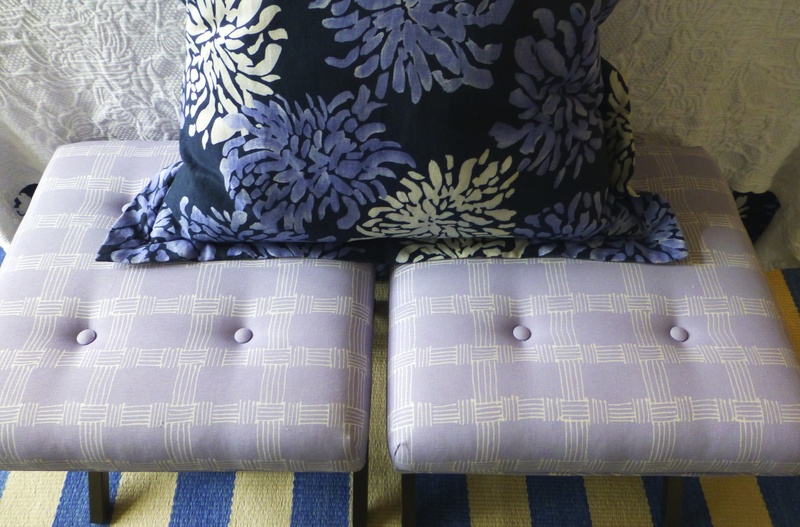 In my search for an upholstered bench or small love seat to place at the bottom of our bed – I hit the jackpot. 20″ x 20″ square stools on sale popped up on my computer screen. They were $75.00 each. In an ugly brown fabric, but that’s an easy fix. Great metal bases in a rubbed black. Sold! Two of these will fit the space perfectly. Now to find fabric to recover them. I used a lot of Seacloth fabric (by Lee Jofa) in this room, so I started my search there. The new fabric had to be in the navy / lavender family. Another find! A pretty Seacloth wisteria pattern called “Mesh” was on sale for $19.99 a yard. Two yards will be plenty for this project. These are the other fabrics in the room. I think the new wisteria fabric will look pretty sitting at the end of the bed. Tally so far: $150 for the two stools. $40 for the fabric. Reupholstery estimate to cover both $175. Total ~ $400, including all shipping. Not bad! Custom stools like these can sometimes run as high as $800 apiece. I have a lot of patterns in this room, so I was a little worried about adding yet another one. But once I got the stools finished and situated at the end of the bed, it was all good! Now I have a place to sit and put on my shoes, dump my clean laundry and park my weekend bag to pack.